Oligopoly. Nash equilibrium. Supply and demand. If these terms send your head spinning, you’re not alone. Economics majors comprise the second largest group of degree-seeking students on campus, with just under 8% of the undergrad population, or 1890 students. For many of these econ-minded anteaters, the major’s 20A, 20B and 100A courses offer their first real look at the foundational – and sometimes confusing - concepts within the core discipline. 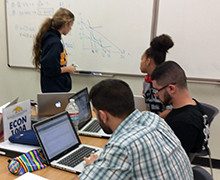 To help, the School of Social Sciences and Department of Economics launched the Economics Learning Center with the assistance of the Office of the Dean of UCI’s Division of Undergraduate Education. From 1:00-9:00 p.m. Monday through Friday, the center is staffed with a rotating crew of 21 teaching assistants and 10 peer tutors who specialize in teaching introductory and intermediate economic concepts. The center promotes a social, group-style learning environment in an effort to develop comfort with both the material and peer groups. The collaborative atmosphere gets students out of their dorm rooms where they may be studying alone—and worrying they’re not getting the core concepts—and brings them together where they can form new friendships, bridge cultural and language divides, and ultimately master the basics of economics. It’s open to any student enrolled in one of the 5 introductory and intermediate course sections (ECON 20A, 20B and 100A), which include around 1,700 students. "The ELC has been exciting to work with and I’ve been happy to see how much our students value the center,” says Brian Jenkins, economics lecturer and center director. 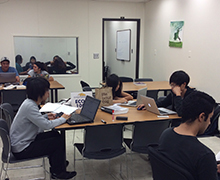 “The graduate TAs and the undergraduate tutors in the ELC are enthusiastic and hardworking. They deserve a great deal of credit for their part in making the project successful." In just five weeks since its launch, the center has received more the 750 student visitors. “Economics is hard, but it really is an essential topic to learn,” says Vivian Choi, senior business economics major and peer tutor for the center. Check it out for yourself! Visit the center online or in person at Social Science Tower, Room 165.